As another Michigan winter approaches, the weather is growing chillier and children are spending less time outdoors. What’s a busy parent to do to break the indoor monotony without breaking the bank? 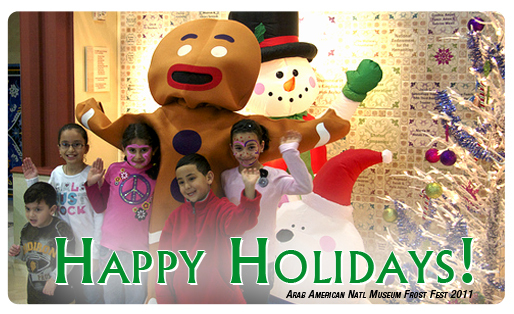 The Arab American National Museum (AANM) has a solution – Frost Fest! From 2-4:30 p.m. on Saturday, December 14, families are invited to attend this winter-themed party featuring games and craft activities for all ages, Kid Karaoke, a raffle with exciting prizes, a pizza feast and a “decorate-a-cookie” station. This year, the AANM has teamed up with Detroit Rescue Mission Ministries to encourage Frost Fest attendees and the public to donate new, unwrapped toys, games, books and clothing for the homeless children up to age 16 currently residing there. Scroll down for more information. Tickets for Frost Fest are $7 in advance online HERE and $8 at the door; all activities and refreshments are included. Adults are admitted FREE; adult food tickets will be available for $2.